After horrifying a lot of you with a picture of 6 single socks I cast on for 2 new socks… Don’t worry, they’re not new, new socks, but the mates to two of my 6 singles. I cast on for one charted pattern to work at home while watching TV and one plain stockinette one for when I’m on the road or just waiting around. The sock on the left is Knitterly Things Vesper Sock yarn that I got in this summer’s sock club knit in a plain stockinette with afterthought heel. The one on the right is Lotus Yarns Aura in Walking With a Ghost in the Snowflake lace pattern. I’ve noticed that most patterns go much faster the second time around and a few months down the road, and this time is not an exception. I knit the first Snowflake Lace sock back in January and now, 8-9 months later, the lace pattern goes much faster. After finally making a decision on the color, knitting gauges to find the right needle size, I finally cast on for my Calvert. 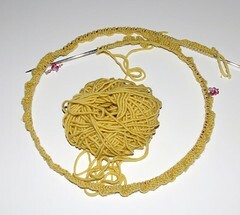 After discussing with a friend the feasability, I decided to cast on for the cardigan in the round, not in pieces. I tell you, casting on almost 300 stitches does take time! Especially when you finish your long tail cast on and then go on and cut off the wrong tail and have to start all over again! Each row takes about forever but I have 4 rows of ribbing done! 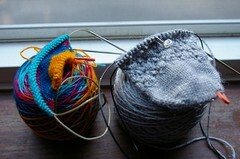 And after finishing the ribbing I get to start decreasing, so I’m looking forward to that time. I’m quite happy with the yarn, I am using Sublime extra fine merino dk, which is basically the same yarn as the recommended yarn. I picked a nice yellow that I think will be nice and cheery to knit and wear but still neutral enough to act as a basic sweater that can go with a lot of things. At least that’s what I’m hoping! So I’ll try not to cast on anything else for a while, or at least until I’ve got some good progress done on this sweater. I’ve managed to contain the “project hopping” down to two projects. I still have a half dozen socks on the needles, but I’m hopeful I’ll work my way through them all. boo for cutting the wrong end, usually I don’t pull out enough yarn for a long tail cast on. Wow! Two socks and a sweater. I’m one sock and two sweaters. And I have done the same thing before and cut the wrong tail!